Paul Ryan, Jeff Sessions and John McCain have all called on Moore to drop out of the Senate race in Alabama. ATTORNEY GENERAL JEFF Sessions voiced no scepticism of accounts by women accusing Roy Moore of groping or pursuing romantic relationships with them when they were teenagers when asked about the situation today. He also hinted that the US Justice Department might look into allegations against the besieged Republican Alabama Senate candidate. “I have no reason to doubt these young women,” Sessions told a House committee. His words seemed certain to carry weight in Alabama, where he was a long-time GOP senator until becoming President Donald Trump’s attorney general this year. He remains one of that state’s most influential Republican voices. Answering questions before the House Judiciary Committee, Sessions didn’t rule out a federal probe into the charges. ”We will evaluate every case as to whether or not it should be investigated,” he said. His remarks came as House Speaker Paul Ryan joined the growing chorus of Washington Republicans calling on Moore to drop out of the race. Republicans fear damage from two potential outcomes should he remain a candidate: Moore wins and GOP senators are tainted by association with a colleague accused of molesting teenagers, or he loses the 12 December election to a Democrat. “These allegations are credible,” Ryan told reporters today. If he cares about the values and people he claims to care about then he should step aside. Moore is showing no sign of quitting and has denied allegations. He has continued to send out fundraising emails that emphasise his supposed stance as a maverick battling establishment politicians. In one sent today, he referred to Senate Majority Leader Mitch McConnell and Republican Senators John McCain of Arizona and Lindsey Graham of South Carolina as “the forces of evil who are attempting to rip and tear apart me and my campaign with their filthy lies and disgusting attacks”. Moore spoke after a tearful Beverly Young Nelson, now 56, detailed allegations to reporters in an emotional appearance in New York. She said, one night when she was 16, Moore offered to drive her home from her after-school job at a restaurant in Gadsden, Alabama. Moore, a regular customer, instead parked behind the restaurant and locked the door to keep her inside, squeezing her neck while trying to push her head toward his crotch and trying to pull her shirt off, Nelson said. In Alabama, Jones unveiled a new campaign ad in which voters, including Republicans, say they can’t vote for Moore. Even before Nelson’s news conference, McConnell took a personal swipe at Moore, based on last week’s Washington Post reports of other incidents involving Moore and teenage girls decades ago. “I believe the women,” McConnell said, marking an intensified effort by leaders to ditch Moore. Cory Gardner of Colorado, who heads the Senate GOP’s campaign organisation said, if Moore is elected, senators should expel him “because he does not meet the ethical and moral requirements” of the Senate. Senator John McCain said Moore “should not be a United States senator, no matter what it takes”. Fellow Republican Senator Jeff Flake – who’s not seeking re-election after criticising Trump – said he’d “vote for the Democrat” if he had to choose between Moore and Democrat Jones. 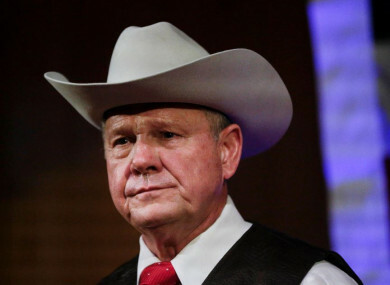 Last week, the Washington Post reported that in 1979, when he was 32, Moore had sexual contact with a 14-year-old girl and pursued romantic relationships with three other teenage girls around the same period. The women made their allegations on the record and the Post cited two dozen other sources. Email “Republicans turn on Roy Moore as several women accuse him of sexual harassment”. Feedback on “Republicans turn on Roy Moore as several women accuse him of sexual harassment”.